Despite my comment in my article about how oddly specific Isolate’s text is, the fact is that there are a lot of targets for it in larger formats. There are all manner of dangerous one-cost creatures, from the ubiquitous Death’s Shadow and Noble Hierarch to the less common but very dangerous Figure of Destiny and Wild Nacatl, and you can occasionally catch something like Relic of Progenitus before your opponent has a chance to use it. My main problem with those uses is that there are already a lot of options to use against them. Is using Path to Exile against Death’s Shadow so much worse than Isolate? How often is the extra land you give them truly relevant? 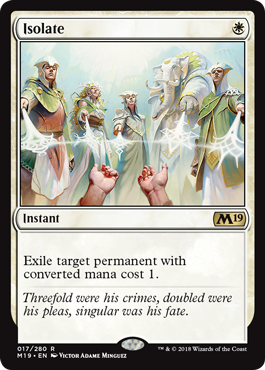 If you are particularly worried about your matchup against those one-cost cards, Isolate will let you overload on answers, but I don’t think it will become entirely required unless Wizards of the Coast goes off the rails and prints a one-cost planeswalker.